Jen, when we visited you this installation work was still in progress. I’m so glad that we get to see this work in the gallery! First of all, how long did it take to fold the paper hexagons? The reason I ask is because there seems to be an interesting dynamic between ephemerality and permanence. The reference object, being an ice pile exposed to the elements, is inherently ephemeral in its physical constitution, yet your sculpture suggests an act of preservation. Could you also elaborate on your encounter with this object? 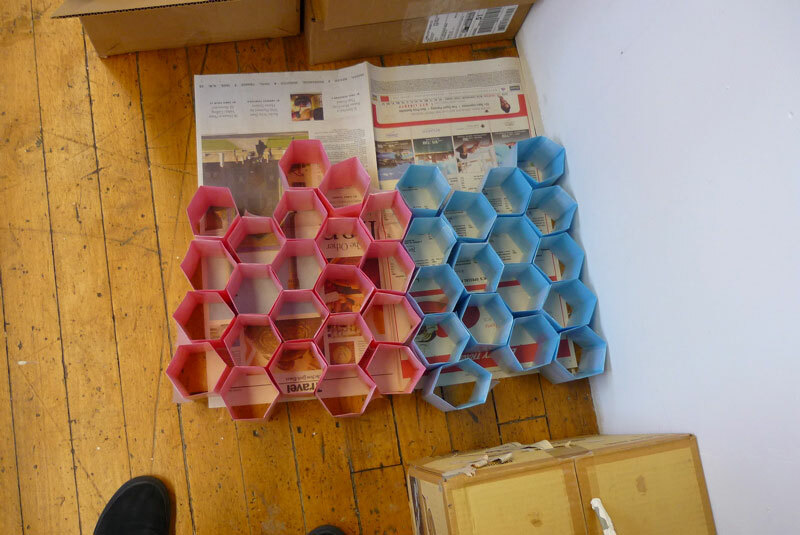 I’m glad to finally see it in a gallery too, because the hexagonal modules were starting to crowd me in my studio! From start to finish, the project took about 6 weeks to realize, and a lot of that time was spent folding. I tend to make everything by hand and rarely rely on fabricated methods, but I was fortunate to have assistance from some friends with that part. Ephemerality has always been fascinating to me. I’ve built temporary architectural structures like tents, created paper sculptures that dissolved in water, and I’ve been occupying myself with an ongoing series of text-based pushpin installations. I admit that these conceptual choices are partly practical solutions — to avoid major costs and hassle in transporting and storing projects, — a strategy I think I share with a lot of artists. On the other hand, I am aware how much we have come to accept art practices by artists that embrace a wide range of materials and make work that is not meant to be preserved, but are not talking about ephemerality per se, like Thomas Hirschhorn or Sarah Sze. I too choose to use everyday materials and objects to reiterate impermanence or how everything is susceptible to collapse or decay, but I’m not interested in preserving anything, even for posterity. I am aghast at how much stuff there is in my life and the world and I often wonder why I insist on being a sculptor in order to contribute to it. On the other hand, there are particularly interesting moments when I am completely enamoured with stuff, like this ice formation. I like that you used the word “encounter” because that’s exactly what the situation was. I saw the formation in April 2006, while traveling in a moving car in St. Marys, my hometown in Southwestern Ontario. 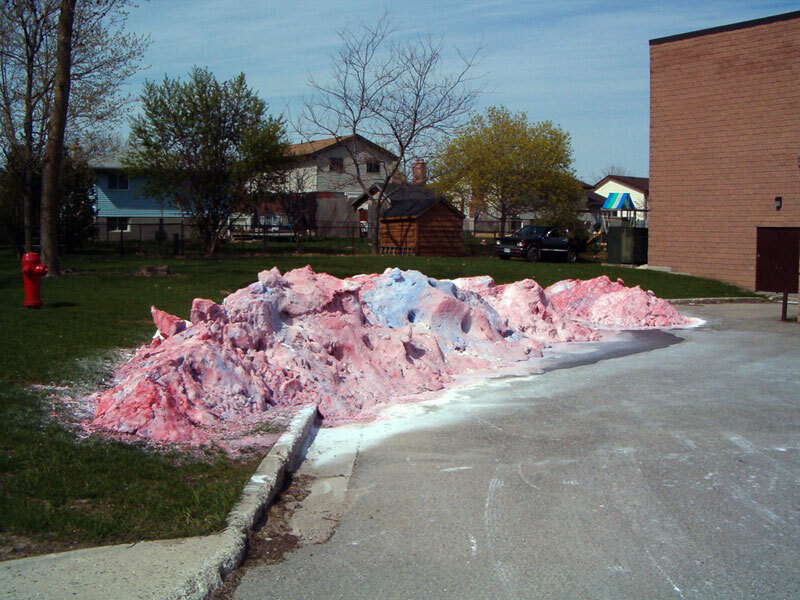 I suppose a giant pile of pink and blue ice on the grass outside a hockey rink is not so unusual, but it was such an incongruous and striking thing, planted in the middle of a suburban landscape, that I felt it had importance. I remember yelling at the driver to pull over so I could document it. I’ve been sitting on the photos since then, and only recently decided to consider them. Revisiting that encounter eventually led me to Robert Smithson, but I didn’t realize the uncanny parallels between our individual practices until later. His essay A Tour of the Monuments of Passaic (published in ArtForum in 1967) was an objective travel diary of his trip back to his hometown, particularly the industrial sites around the area. Snapshots of these sites, shot with his Kodak Instamatic, accompanied the essay. Smithson was interested in those non-sites — leftover structures or characteristics that reacted to or punctuated the landscape, like suburbs, freeways, even piles of dirt and gravel, but he elevated them to monumental stature. 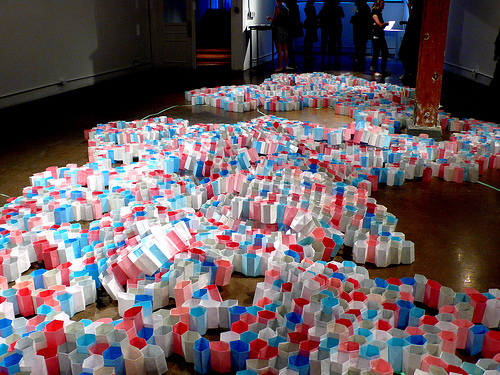 As well, earlier essays on Donald Judd and one aptly titled The Crystal Land, which describes a trip he and Judd made to New Jersey to look for crystals, reveal Smithson’s interests in crystallography and geology and make formal and conceptual connections to those fractal patterns repeated in the built environment. Again, this sculpture isn’t something I plan to preserve, but I am happy that this project will have a “second life” in an exhibition opening this October at Gallery Stratford. It will be in a different configuration and will be shown alongside some drawings, photographs and objects that elaborate on these associations to Smithson and my history as well. I’m happy to be showing it there so close to where I found the ice form as well. I’m also interested in your choice of paper, which implies both fragility and strength through its architectural manipulation. I’d like to explore this by way of the notion of monumentality, which was the part of the concept behind this work’s deployment at the Deleon White Gallery. Could you elaborate a bit on the logic of monumentality and publicness in the way you responded to the reference object with folded paper? Paper is a familiar material for me, and I use it often in other projects. And it’s true; it’s both fragile and strong, depending on how it is manipulated. Waxed paper is great stuff: it is translucent, accepts a fold well, and is inexpensive. 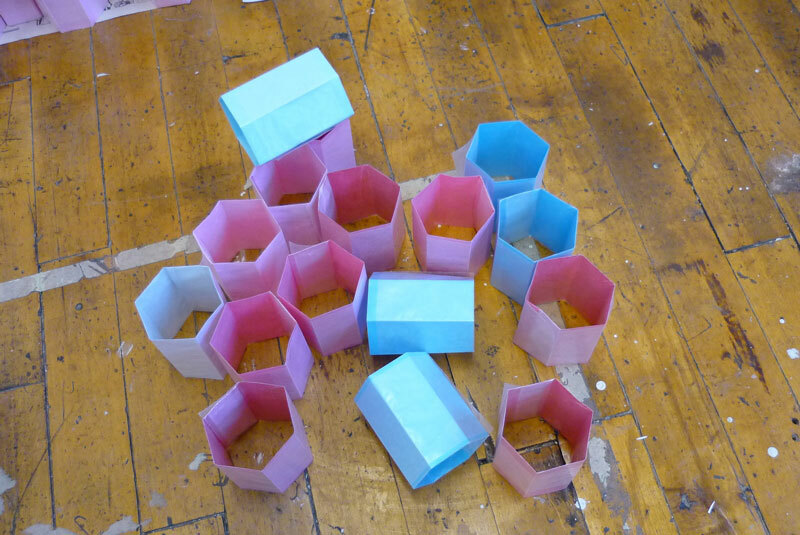 It is too flimsy on its own, but it was a real coup to discover that a small strip of paper folded into the shape helped strengthen and add colour to the final individual module. Initially I felt that I wanted to create a model of the form, something that had height, but I found that there were some nice moments where the modules just hugged the floor. 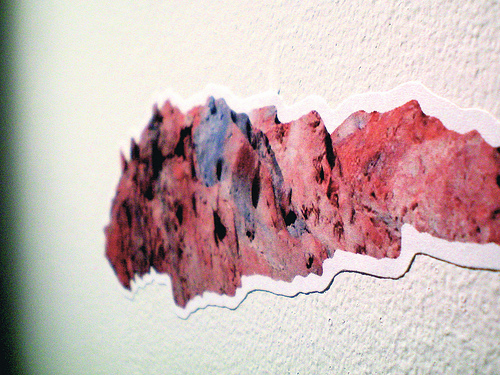 I decided to stick with that strategy, coaxing them into more relaxed, and undulating topographies. There are ribbons and clusters of hexagons that meander across the floor, creating more perforated areas; larger, pyramidal units that bump up against each other like ice floes; and slabs of modules that heave and buckle over each other in seismic shifts. Creating these variations in the landscape was when I really started having fun with the project. I think my material choices and presentation reaffirm its location in a present yet tenuous time frame, while also emphasizing its ethereal characteristics. Still, another way to define monumentality is “presence”. The surface of the installation is vast, and forms a pixilated plane that won’t let the eye rest. 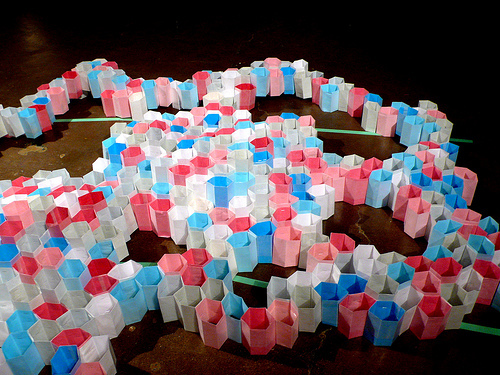 Although it stays close to the ground, this installation does yield an arresting effect. Going back to this theme of ephemerality, I wanted to bring up the way you preserved that fleeting reference object. You did this first by photographing it and secondly by painstakingly folding thousands of pieces of paper. Would it be fair to say that there is a sense of reparation, even lamentation for the original object? That in seeing something fleeting, you chose to honour it, even revalue it through mimetic reconstruction? I couldn’t help but read the installation’s flattening of the form to floor-level as a visual cue to the ice pile’s logical end–as a puddle. Could this be the reason for the hexagonal shapes — might they reference water molecules? A snapshot triggers a mental recall of a place or thing, but it can never be preservation. Strangely, I think that the ice form looks more fake in the photographs than how I remembered it, so their accuracy is dubious. I don’t think the reparation solely came about in the work either. 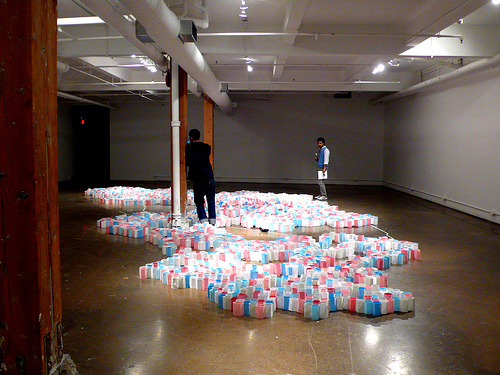 Although my assistants and I folded about 6000 modules (I ended up using about 5000 in the installation at DeLeon White), I struggle with the idea, here and elsewhere, that quantifying labour or output generates meaning. I won’t deny that the folding was an arduous task, but trying to put a number on it makes it come up short. Why didn’t we fold 10,000? 100,000? In quantifying that process, outcomes are infinite, but there’s only so much time, so much money, so much space in the gallery … It’s practical reasons that negotiate those outcomes. 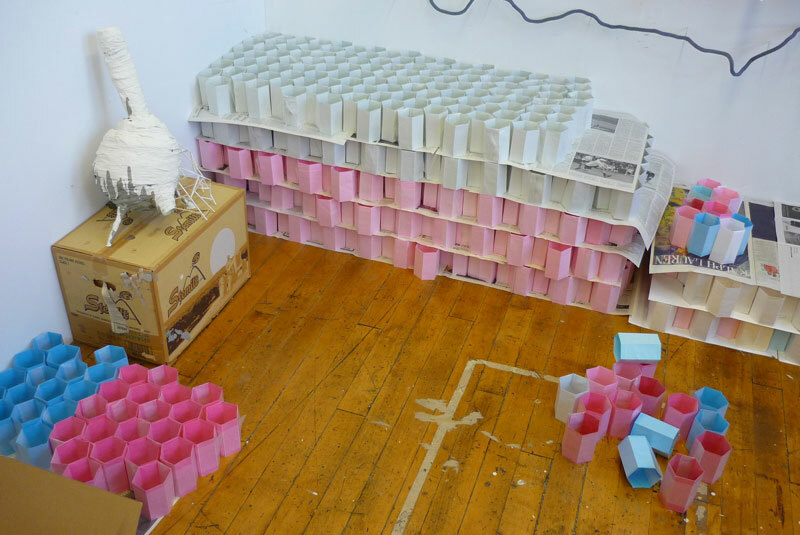 I wanted it to be an installation that could be physically navigated, so I placed a reasonable cap on the number of modules I had to produce. 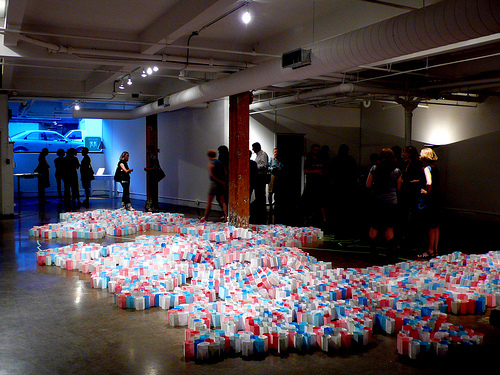 The installation has become an illustration of the original landform, loosely based on about 8 or 9 digital snapshots taken on a whim in 2006. I’m interested how these individual modules create a pixilated model of a memory embedded in a digital photograph, but in a very low-tech way. I would also say it is painterly, which excites me very much. I think there are many ways of representing this landform; I’ve only presented two here, but plan to do more. I wasn’t thinking about creating a puddle, but I like that connection. A friend of mine wondered if my early training in printmaking influenced this piece, in the way that the surface appears like a halftone screen. At the microscopic level, water does crystallize in a hexagonal pattern when it freezes. This same pattern is a natural occurrence found in honeycomb and basalt deposits. Right now I’m reading The Beehive Metaphor: From Gaudi to Le Corbusier by Juan Antonio Ramirez, which discusses the influence of apiculture (the study of bees) on modern architecture. With that in mind I can see an aerial topography, a cityscape, or even clusters of individual modular residences in my installation. So even something that is simultaneously ordinary and unusual, natural and fabricated still resonates with many tangible references. I think those allusions add some nice layers to the project, but still make its purpose elusive.